Eric and I have been working on our rental property. We have been hemming and hawing and searching for a property to purchase for years now. We haven’t found the right spot, and so we’re still renting our current home. We haven’t found our ideal homestead, and we’re tired of waiting. We like living here pretty well, but lately are find ourselves tired of not sinking our roots in where we live. Over the past few years, we’ve been encouraging the growth of plants that come back every year or self-sow in a corner of the yard. That’s why I make so many things with Nettles, Chickweed, Mint, Soapwort, Motherwort, Clover, and Yarrow. They live here full year round, same as we do, but we don’t really “tend” them so much as just occasionally weed the patch and harvest them in a sustainable and respectful manner. We are lucky renters. Our landlords are happy to let us garden and don’t mind us modifying the yard to do so, but I don’t feel the need to have a full in-ground garden plot right now. Our home is on a slope and the property is more vertical than horizontal, for one. Secondly, I’ve got a full time job that prevents me from tending the garden as well as I’d like to, and to boot, there’s a mess of groundhogs that live on the lower lot and would threaten our tasty veggies. 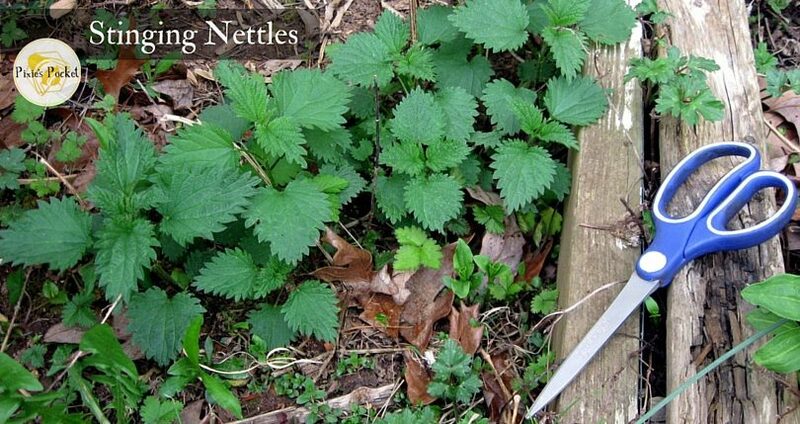 Harvest the young tops of nettles for food in the spring. Proceed with caution or learn to love the burn! Another improvement we’ve been considering is adding some fencing to the property. We’d love to just let the dog run and know that her hound nose isn’t betraying her by leading her into a dangerous situation miles away. It’s also because we’re ornery and don’t like being observed from the road. Everyone driving by literally looks down at us. It isn’t because they are rude, it is because of that hill thing I mentioned in the first paragraph. Our desire for fencing might also have a bit to do with the large and dumb, yet friendly dog of our neighbor who loves to visit our dog and never, ever leave. Her favorite past-time is biting my dog’s face and drooling on her. So…fencing. The area in our front yard where we want fencing is rocky and very hard and dry. Instead of trying to drive stakes or poles into that surface, we came up with a genius idea. GENIUS! My idea, actually. Normally Eric’s the one with the really good ideas, so I’m pretty pleased. The Genius Idea: We’re going to line our front yard with garden boxes and staple a wall o’trellis up behind them. Yay! The vining plants will have something to grow up, and their leaves will form the wall during the growing season. Sandy scopes out the raised bed. Mostly, she just wanted to play with the hose. Luckily for me, Eric enjoys planning and building things just as much as he likes salvaging junk out of trash piles. We now have one raised bed made out of scrap plywood, a few 2x2s, deck screws, and bottoms made of a pallet cut in half. It measures 4 feet long, 18 inches wide, and a foot deep. The boxes are lined with landscape cloth, and they are raised up out of the reach of voles and groundhogs by a pallet cut in half. It took 4 cubic feet of dirt and compost to fill it up. The first completed one became the home for our two potted pineapple plants. I don’t get along well with pointy plants which is part of why I moved to the mountains, away from the beach. I can handle thistle, nettle, burdock and the like, but the saw-tooth grasses and spiny death ferns* of the coastal sands and swampland of my youth are the stuff of nightmares. That might account for why I’ve struggled with these pineapple plants. I want to be their friend. From what I understand, they might even grow pineapples. Pineapples are delicious fruit! Time and time again, I’ve watered these guys but was thanked by scratches and pokes. I tried to catch a pot that was falling from the plant shelf once and it nearly speared me in the eye with it’s sharpest leaf! These poor things have been troopers despite my nearly complete neglect of them. Sure, I watered them every now and then, but there was more roots and black ants than dirt when I pulled them free from their pots. I don’t know if they’ll ever make fruit for me, and I don’t blame them if they scorn me. I feel good about it though. Since they’ve been in the new raised bed, they have been glowing like Nirnroot in Skyrim. I even hear them making a happy, tinkling sound when I walk by them! In other gardening news, the neighbors gave us a huge flat of Bonnie tomatoes because they overestimated their garden space. I wasn’t going to grow tomatoes this year, you know. While I love a fresh tomato in the summertime, we don’t have tomatoes on our dinner table often. They tend to be too acidic for our diet. But since we’ve got them, we’ll grow them! I do like to can tomatoes so I can make my own spaghetti sauce every now and then. Tomatoes, both determinate and indeterminate. Most of the tomatoes given to us are determinate and there are only three that are indeterminate. Indeterminate tomatoes are the ones that grow to be bush-like. I’ll put those in the garden boxes to grow up with the Basil. The determinate tomatoes tend to be large, tall, and vining. 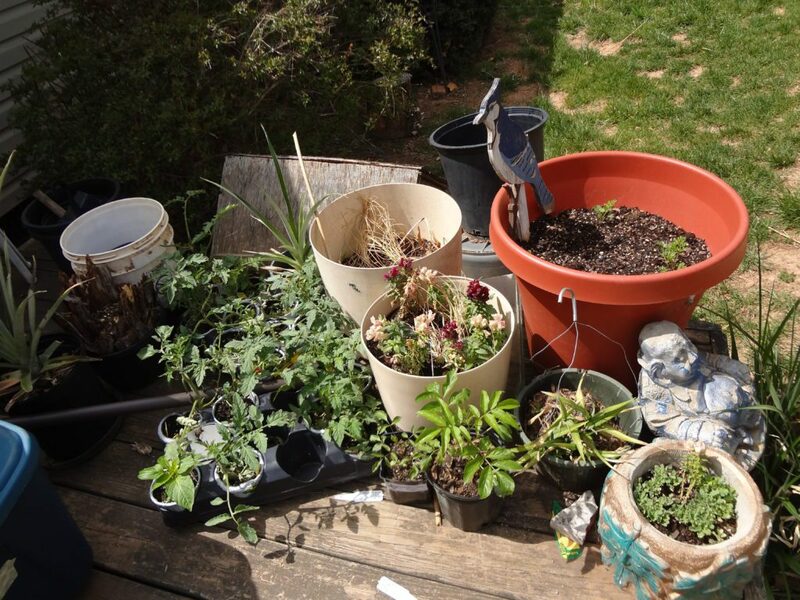 They need more support like cages or trellis, so we’ll grow those in large pots with something they can climb on. Maybe they’ll be part of our trellis wall? The links in the next paragraph take you to find seeds or live plants at Richter’s Herbs. If you buy some, I’ll get credits that I can spend on buying seeds and plants. Feed my habit! Realizing how many pots and raised beds I have to work with has me excited. I’ve started seeds, too. There’s Genovese Basil and Sweet Basil starting to peek their wee heads above the dirt. 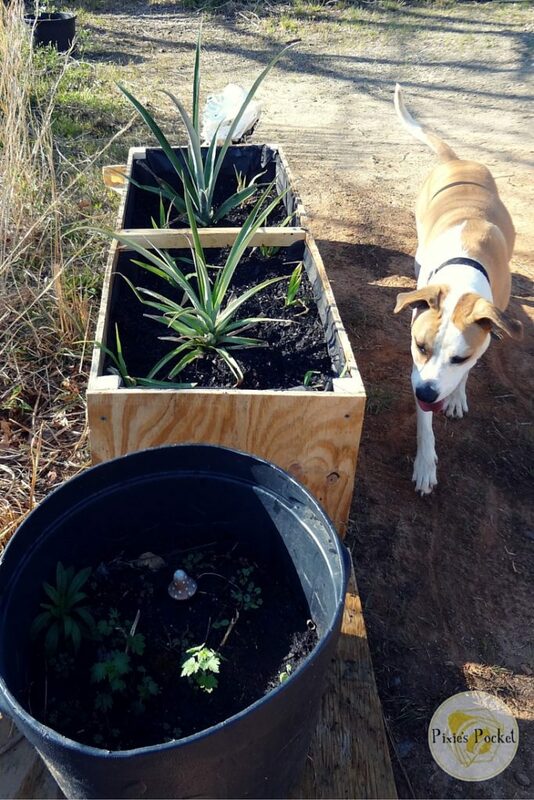 The other herbs – Oregano and Sage – haven’t yet appeared. I planted some Cranberry Hibiscus seeds and they were up and had leaves in 48 hours! I had to pull them out of the tray and get them away from the seeds that still need a bit of dark to germinate. We had an old chair taking up a corner of our porch for over a year or so, I guess. I think I recall finding it on the side of the road somewhere. I’m sure we had grand plans for it, but it ended up sitting there, dryrotting in the weather. As we tidied up the porch the other afternoon, I decided to re-purpose the still-sturdy wooden chair as a planter. I pulled off the rotted cloth seat and shoved in a plastic pot. It was filled with dirt, water, and some Four O’Clock seeds from my Mother in Law. Come to think of it, she sent the Cranberry Hibiscus seeds, too. As well as the Cuban Oregano. And she’s also responsible for one of the pineapples. Thanks, Connie! I’ll post more as the garden lives or dies, succeeds or fails. Learn from my mistakes, people! How does your garden grow? What are you trying out new this year? 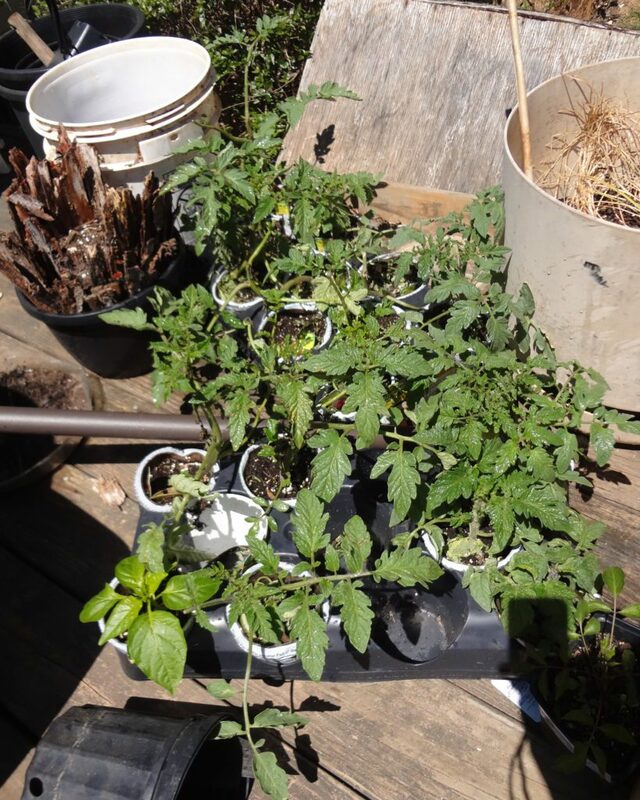 What do you do with 18 surprise tomato plants?